Activator Week 14 Day 1 Write an engaging newspaper headline for at least one of these pictures. 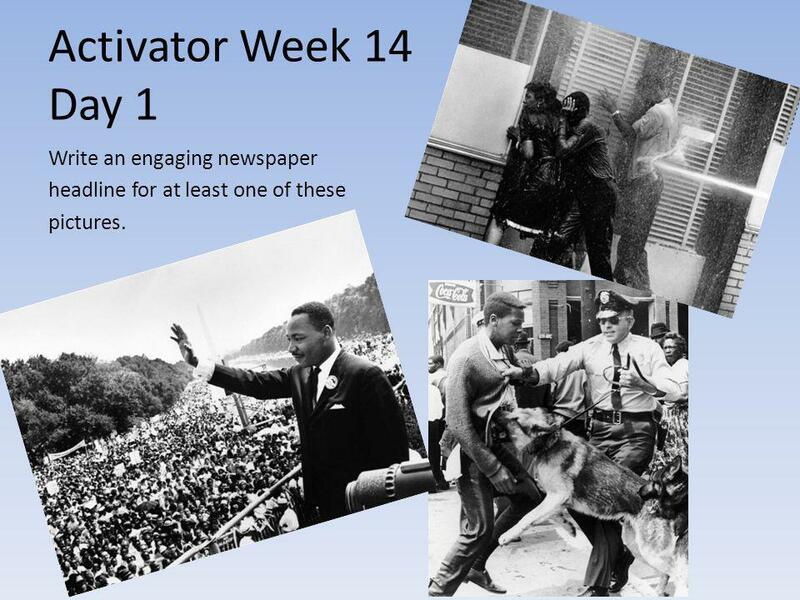 1 Activator Week 14 Day 1 Write an engaging newspaper headline for at least one of these pictures. 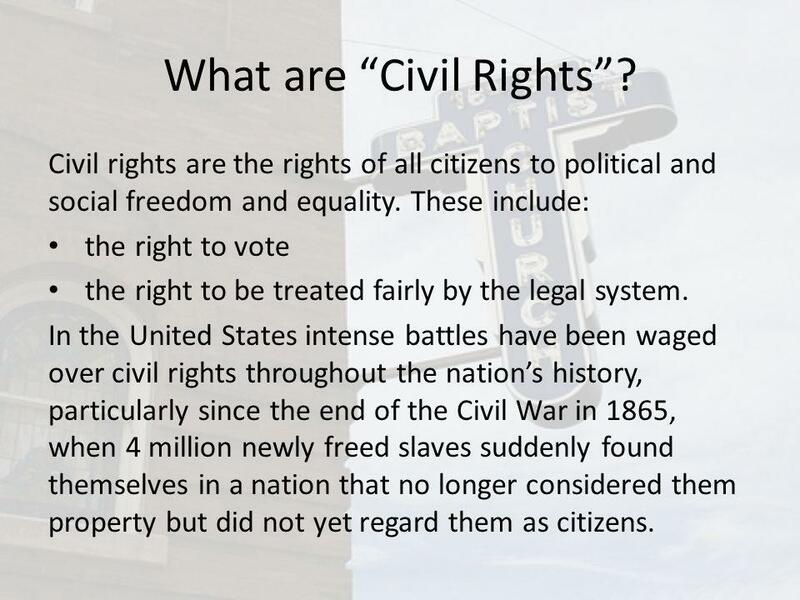 2 What are Civil Rights? Civil rights are the rights of all citizens to political and social freedom and equality. These include: the right to vote the right to be treated fairly by the legal system. In the United States intense battles have been waged over civil rights throughout the nations history, particularly since the end of the Civil War in 1865, when 4 million newly freed slaves suddenly found themselves in a nation that no longer considered them property but did not yet regard them as citizens. 3 Civil Rights Movement Birmingham 1963 By April of 1963, Birmingham, Alabama had become a national example of racial tension and strife. 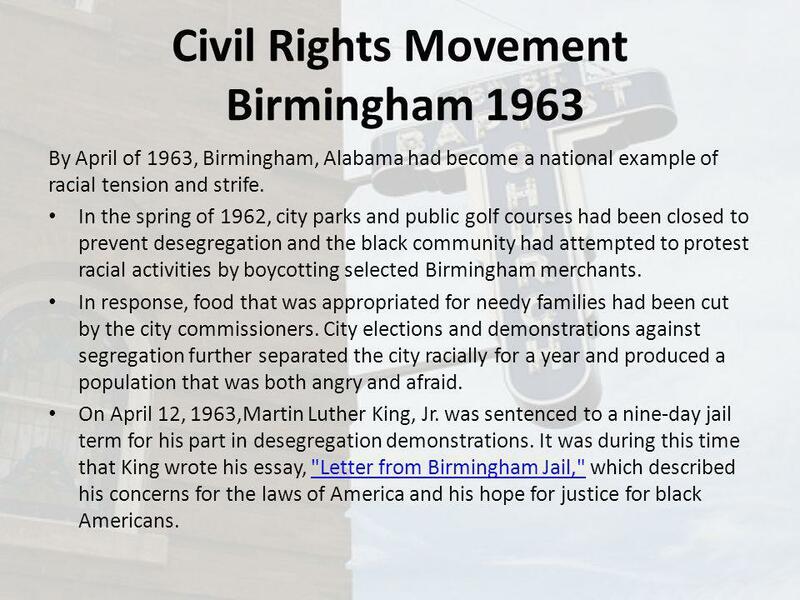 In the spring of 1962, city parks and public golf courses had been closed to prevent desegregation and the black community had attempted to protest racial activities by boycotting selected Birmingham merchants. In response, food that was appropriated for needy families had been cut by the city commissioners. City elections and demonstrations against segregation further separated the city racially for a year and produced a population that was both angry and afraid. On April 12, 1963,Martin Luther King, Jr. was sentenced to a nine-day jail term for his part in desegregation demonstrations. It was during this time that King wrote his essay, "Letter from Birmingham Jail," which described his concerns for the laws of America and his hope for justice for black Americans. 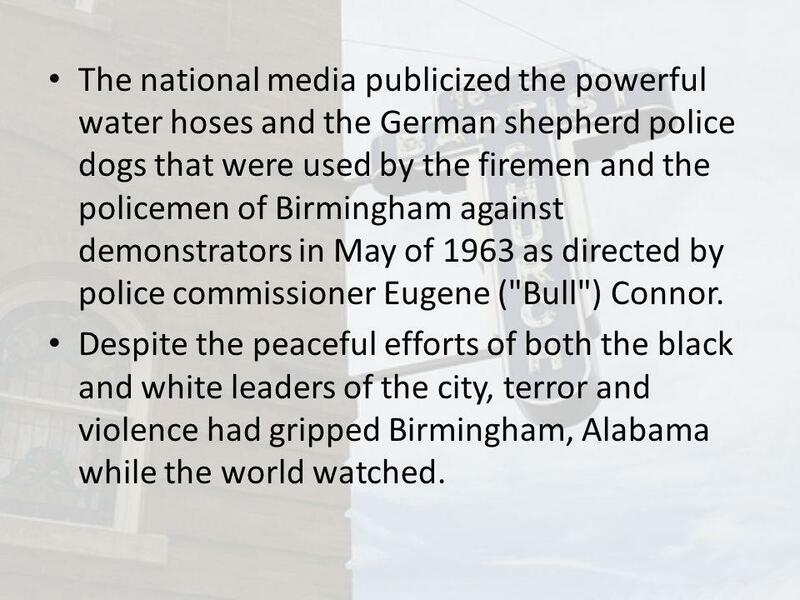 "Letter from Birmingham Jail,"
4 The national media publicized the powerful water hoses and the German shepherd police dogs that were used by the firemen and the policemen of Birmingham against demonstrators in May of 1963 as directed by police commissioner Eugene ("Bull") Connor. 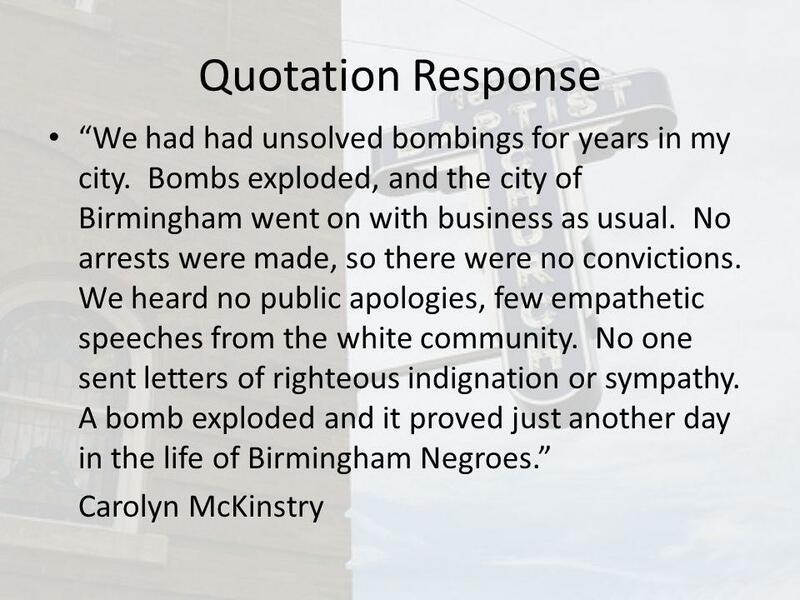 Despite the peaceful efforts of both the black and white leaders of the city, terror and violence had gripped Birmingham, Alabama while the world watched. 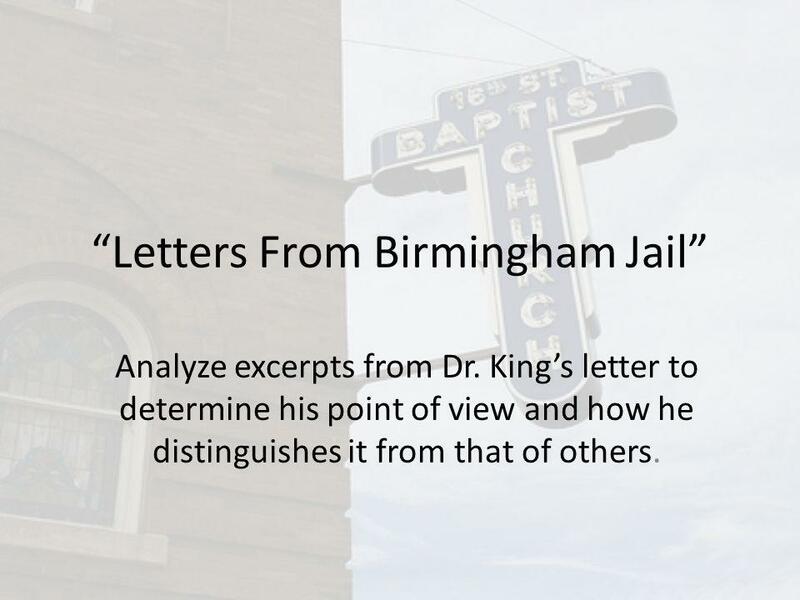 5 Letters From Birmingham Jail Analyze excerpts from Dr. Kings letter to determine his point of view and how he distinguishes it from that of others. 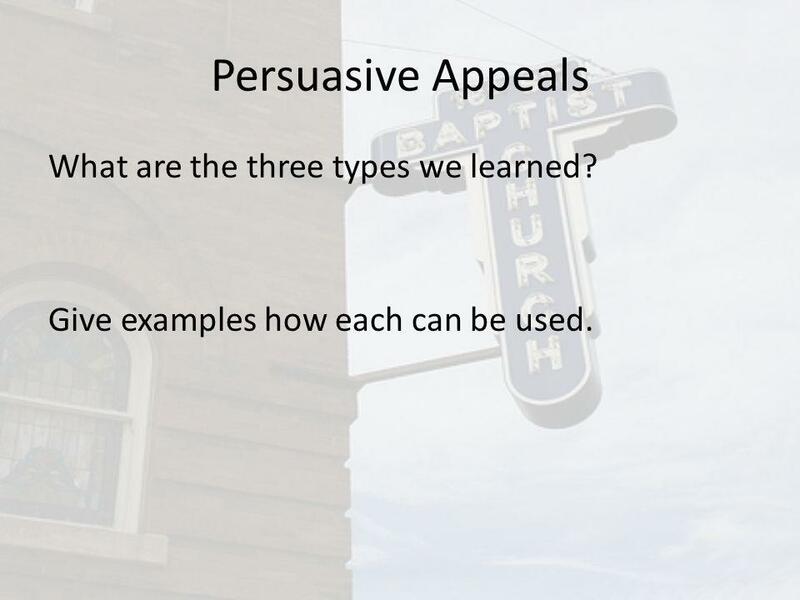 8 Persuasive Appeals What are the three types we learned? Give examples how each can be used. 9 What is a point of view? What you feel, think, or believe about a topic. Analyze the following documents to uncover the authors point of view. 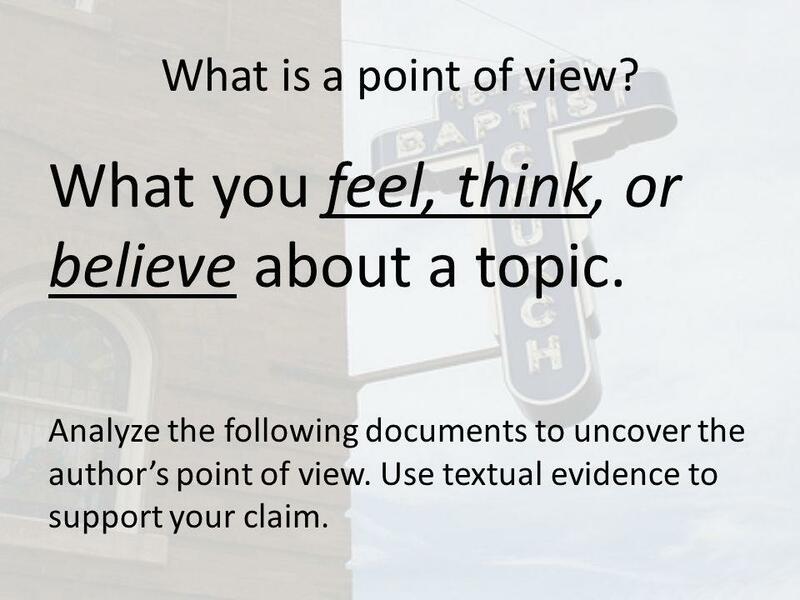 Use textual evidence to support your claim. 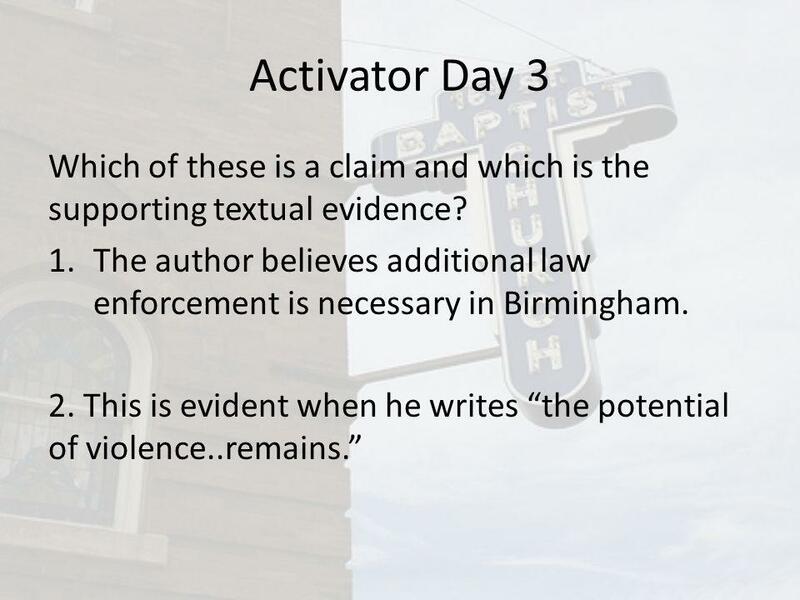 11 Activator Day 3 Which of these is a claim and which is the supporting textual evidence? 1.The author believes additional law enforcement is necessary in Birmingham. 2. This is evident when he writes the potential of violence..remains. 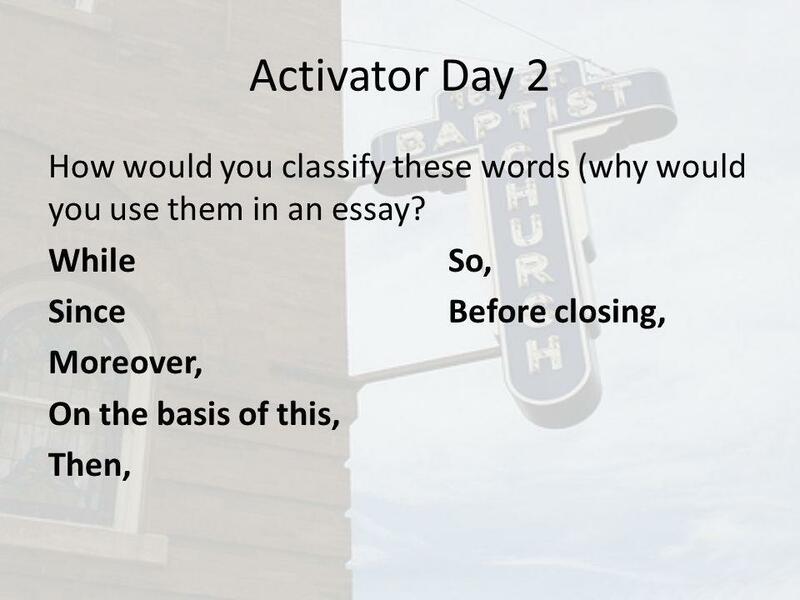 12 Activator Day 4 Select one poorly worded claim and explain how to improve its effectiveness. 1.He said I am cognizant of the interrelatedness of all communities. 2.I cannot sit idly in Atlanta and not be concerned… 3.Dr. 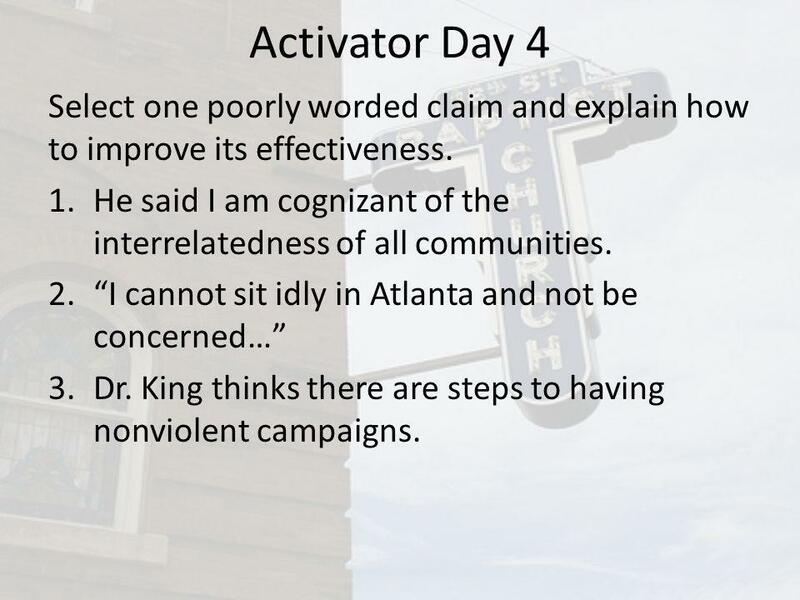 King thinks there are steps to having nonviolent campaigns. 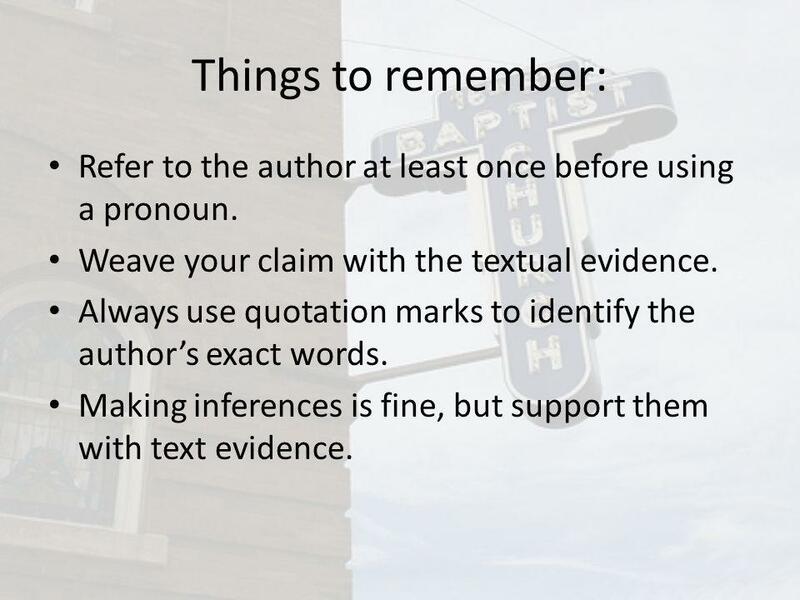 13 Things to remember: Refer to the author at least once before using a pronoun. Weave your claim with the textual evidence. Always use quotation marks to identify the authors exact words. Making inferences is fine, but support them with text evidence. 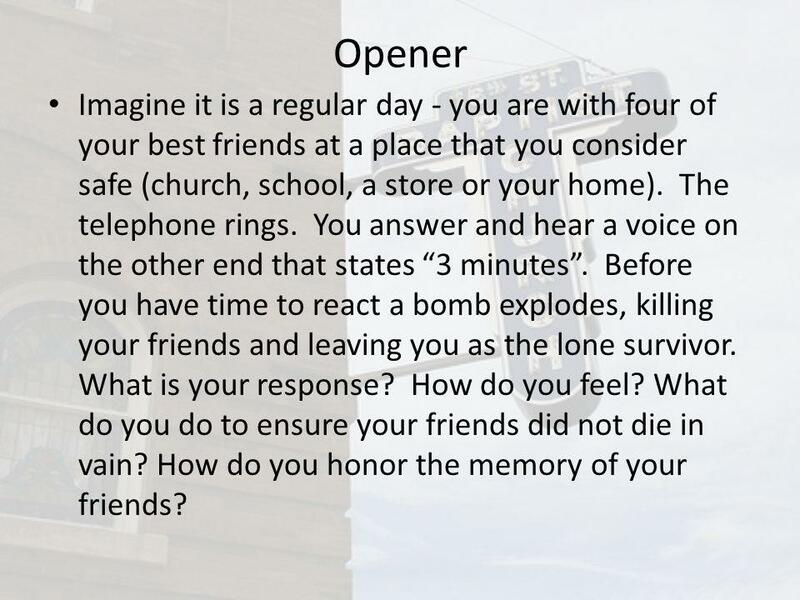 16 Opener Imagine it is a regular day - you are with four of your best friends at a place that you consider safe (church, school, a store or your home). The telephone rings. You answer and hear a voice on the other end that states 3 minutes. Before you have time to react a bomb explodes, killing your friends and leaving you as the lone survivor. 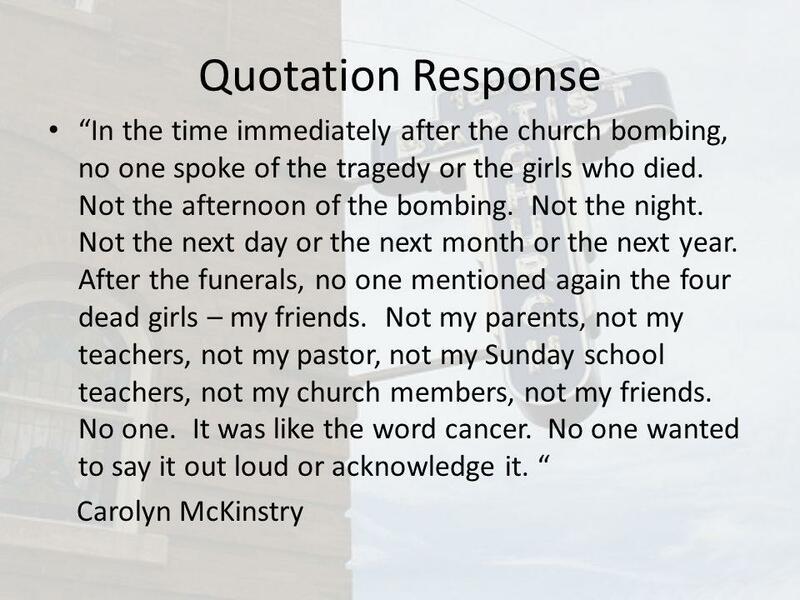 What is your response? How do you feel? What do you do to ensure your friends did not die in vain? How do you honor the memory of your friends? 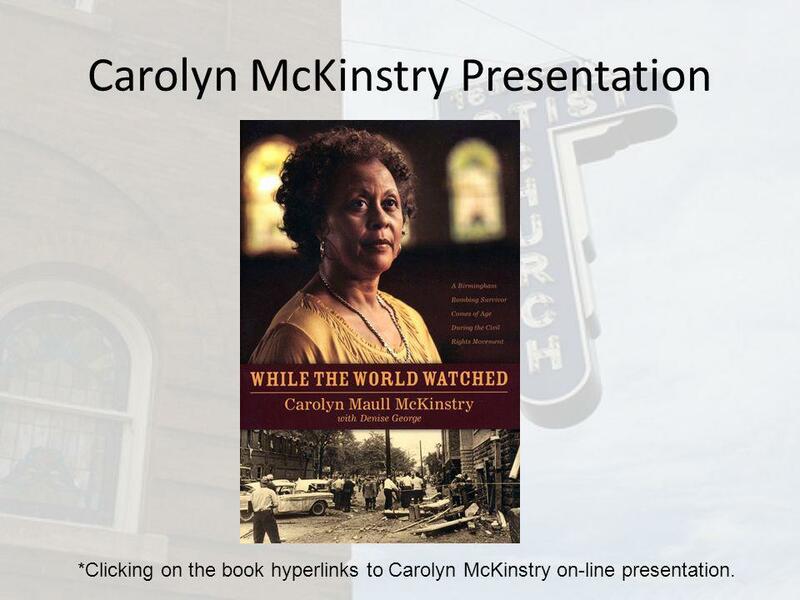 18 Carolyn McKinstry Carolyn McKinstry grew up in Birmingham, Alabama in the 1950s-1960s during the most tumultuous decades in black-white relations in the history of America. 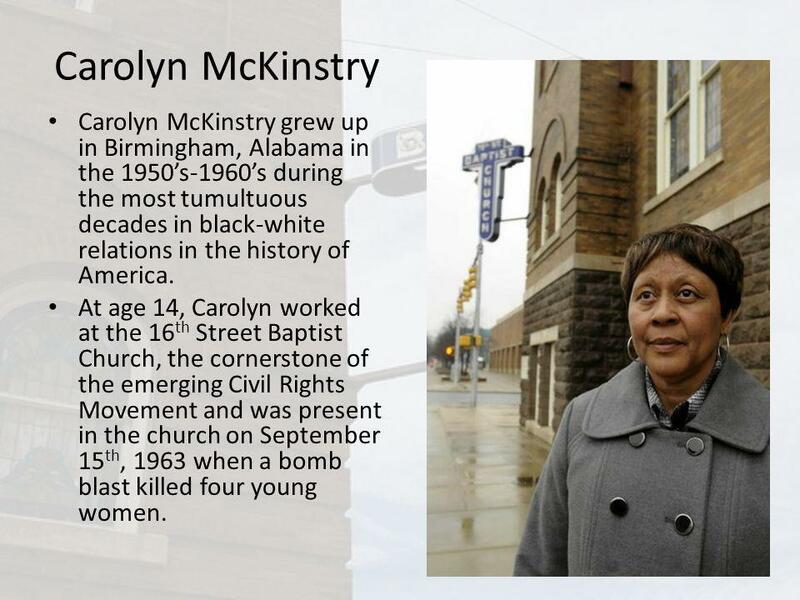 At age 14, Carolyn worked at the 16 th Street Baptist Church, the cornerstone of the emerging Civil Rights Movement and was present in the church on September 15 th, 1963 when a bomb blast killed four young women. 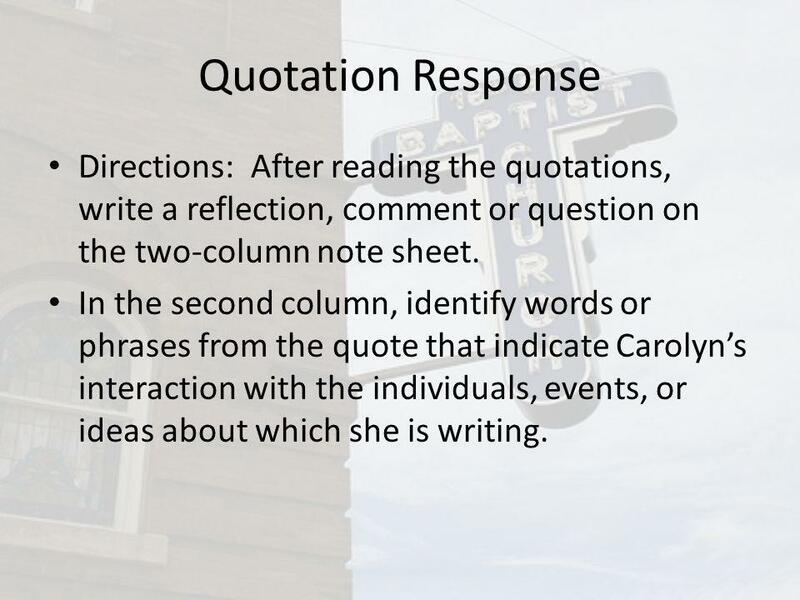 19 Quotation Response Directions: After reading the quotations, write a reflection, comment or question on the two-column note sheet. 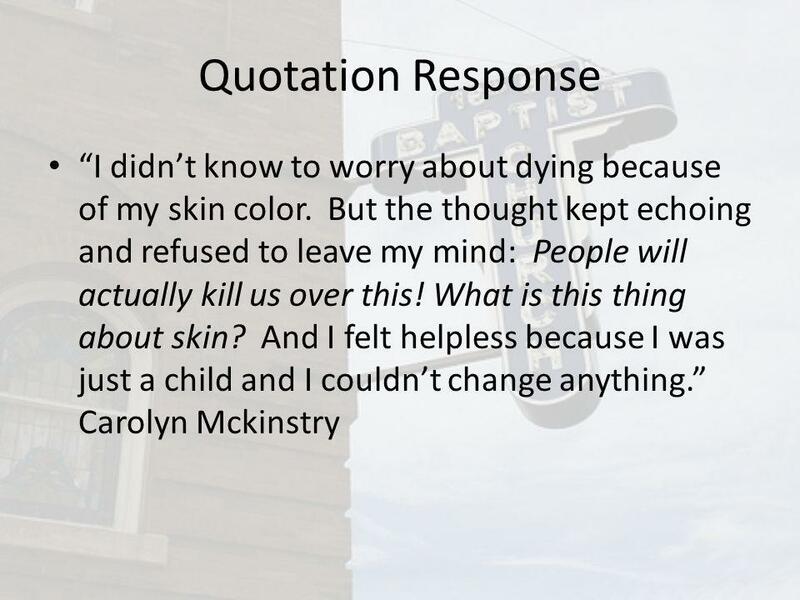 In the second column, identify words or phrases from the quote that indicate Carolyns interaction with the individuals, events, or ideas about which she is writing. 27 Quotation Response The innocent blood of these little girls may well serve as a redemptive force that will bring new light to this dark city. 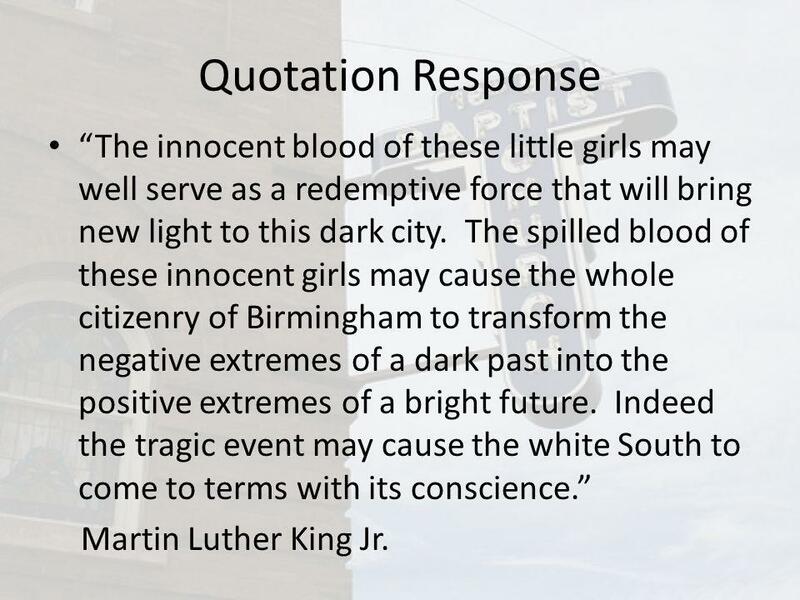 The spilled blood of these innocent girls may cause the whole citizenry of Birmingham to transform the negative extremes of a dark past into the positive extremes of a bright future. Indeed the tragic event may cause the white South to come to terms with its conscience. 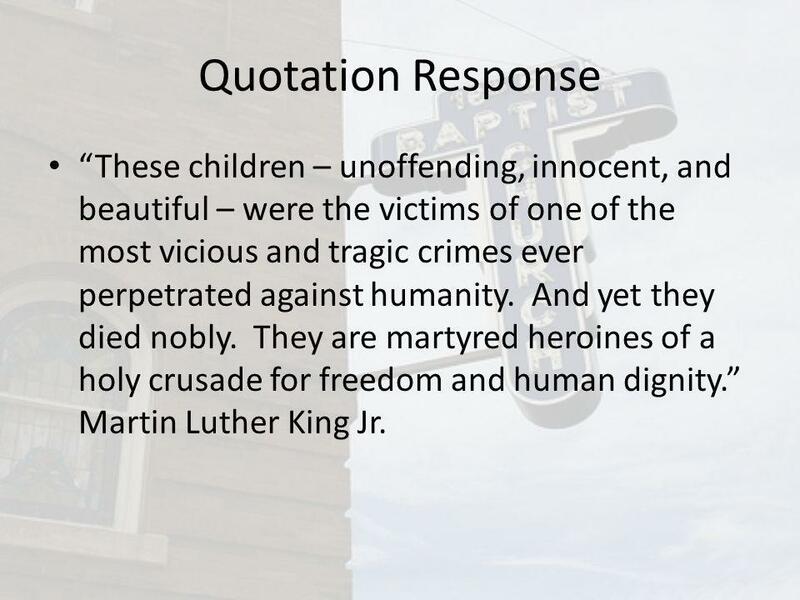 Martin Luther King Jr.
28 Quotation Response These children – unoffending, innocent, and beautiful – were the victims of one of the most vicious and tragic crimes ever perpetrated against humanity. And yet they died nobly. They are martyred heroines of a holy crusade for freedom and human dignity. 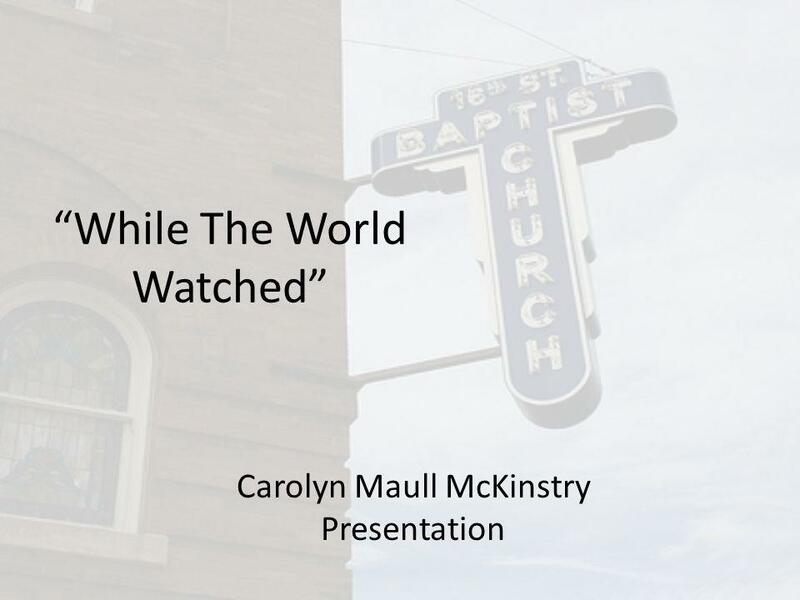 Martin Luther King Jr.
30 Carolyn McKinstry Presentation *Clicking on the book hyperlinks to Carolyn McKinstry on-line presentation. 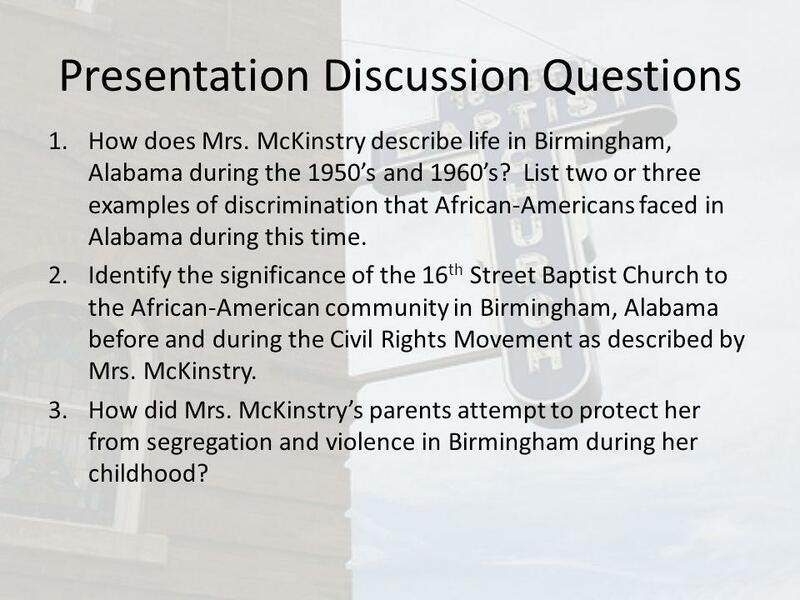 31 Presentation Discussion Questions 1.How does Mrs. McKinstry describe life in Birmingham, Alabama during the 1950s and 1960s? 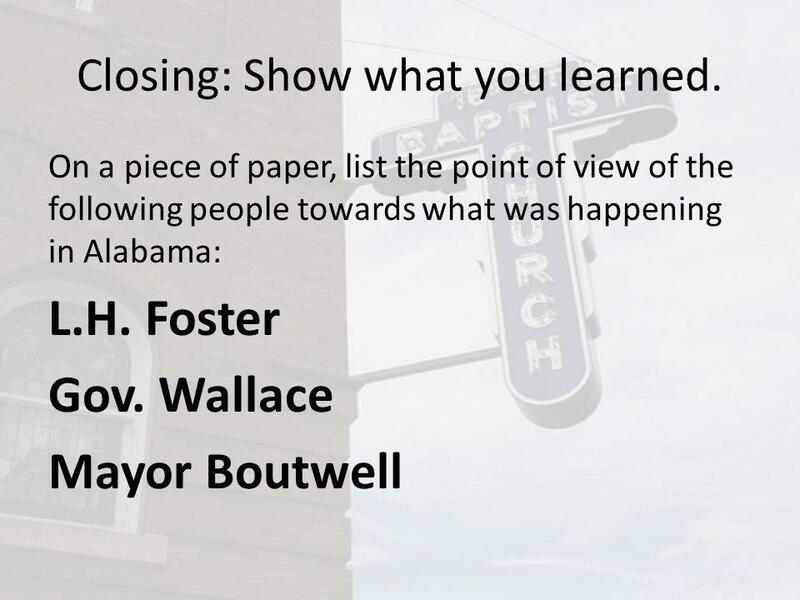 List two or three examples of discrimination that African-Americans faced in Alabama during this time. 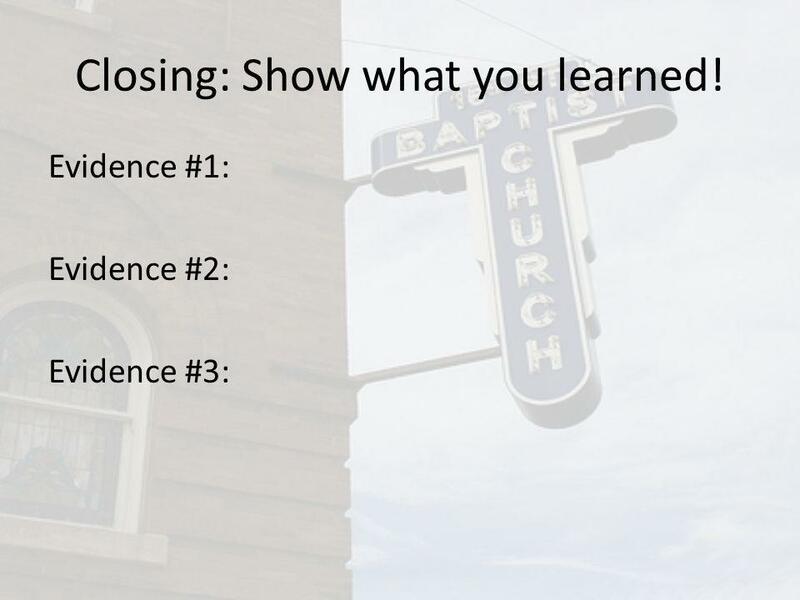 2.Identify the significance of the 16 th Street Baptist Church to the African-American community in Birmingham, Alabama before and during the Civil Rights Movement as described by Mrs. McKinstry. 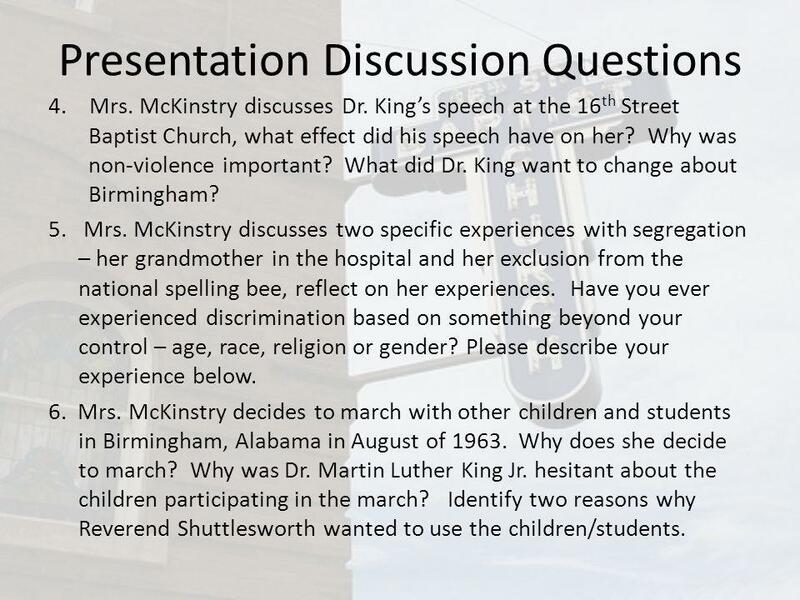 3.How did Mrs. McKinstrys parents attempt to protect her from segregation and violence in Birmingham during her childhood? 32 Presentation Discussion Questions 4. 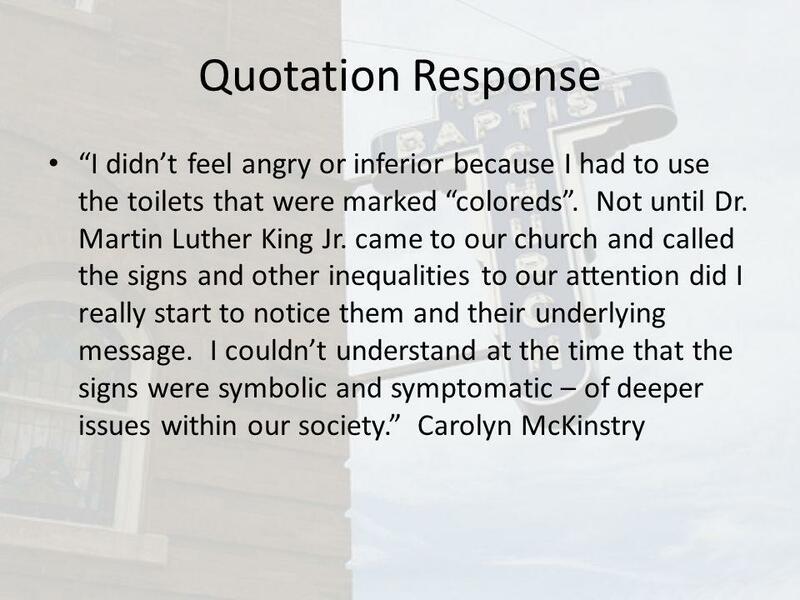 Mrs. McKinstry discusses Dr. Kings speech at the 16 th Street Baptist Church, what effect did his speech have on her? Why was non-violence important? 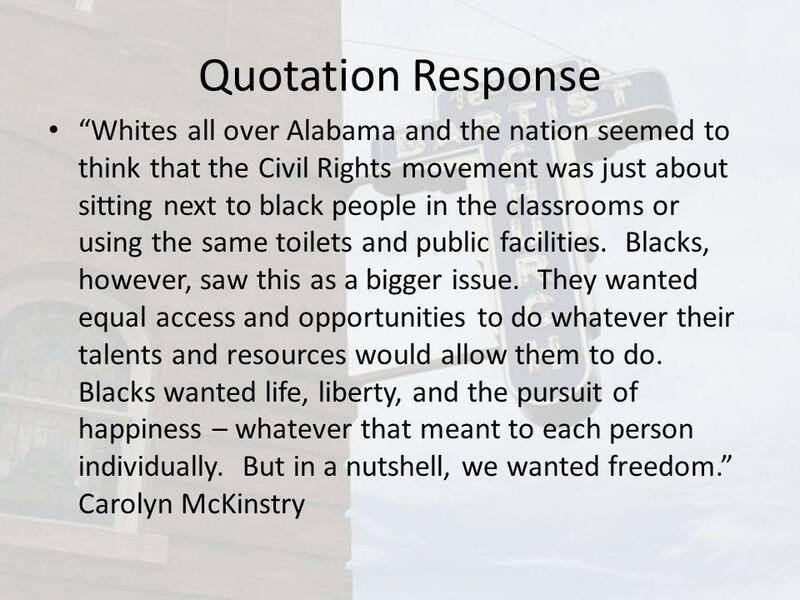 What did Dr. King want to change about Birmingham? 5. 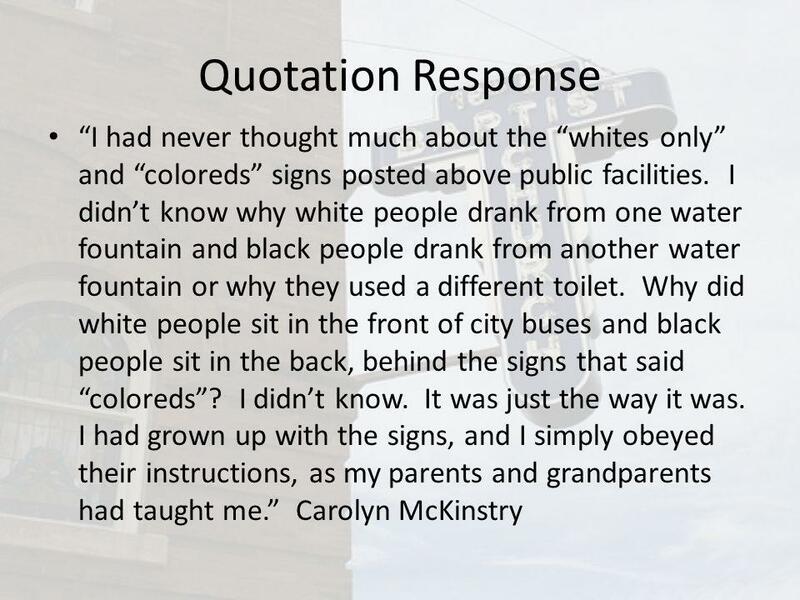 Mrs. McKinstry discusses two specific experiences with segregation – her grandmother in the hospital and her exclusion from the national spelling bee, reflect on her experiences. Have you ever experienced discrimination based on something beyond your control – age, race, religion or gender? Please describe your experience below. 6. Mrs. McKinstry decides to march with other children and students in Birmingham, Alabama in August of 1963. Why does she decide to march? Why was Dr. Martin Luther King Jr. hesitant about the children participating in the march? 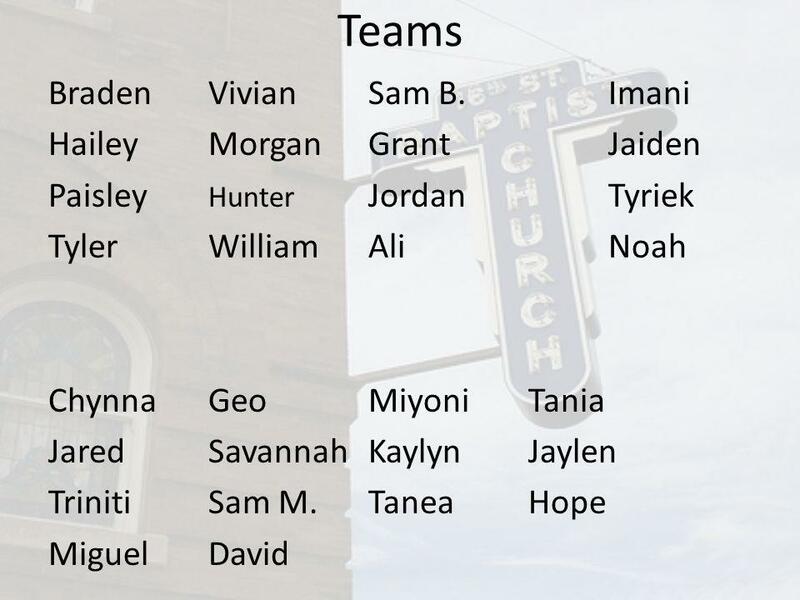 Identify two reasons why Reverend Shuttlesworth wanted to use the children/students. 33 Presentation Discussion Questions 7. 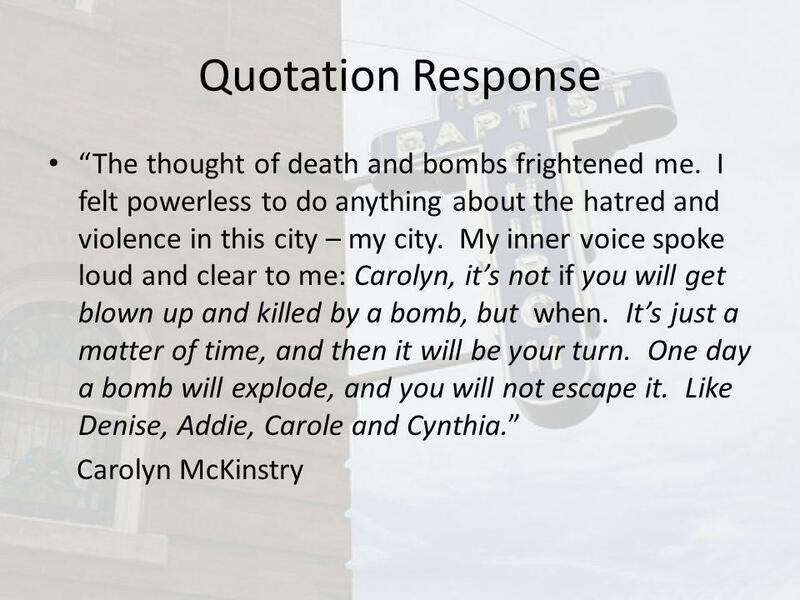 Mrs. McKinstry discusses the constant threat of bombings in Birmingham, Alabama during her youth – describe what it would be like to leave someplace where your life was in constant physical danger. How would you feel about this? 8. 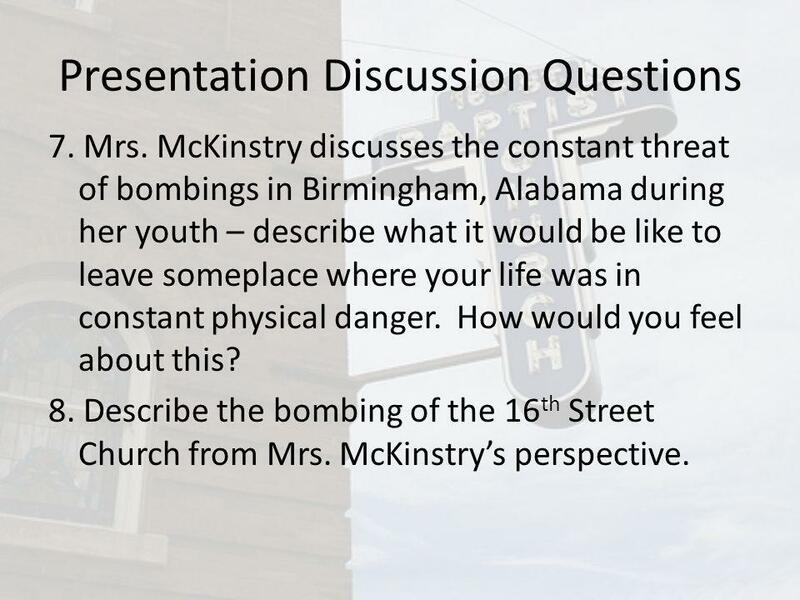 Describe the bombing of the 16 th Street Church from Mrs. McKinstrys perspective. 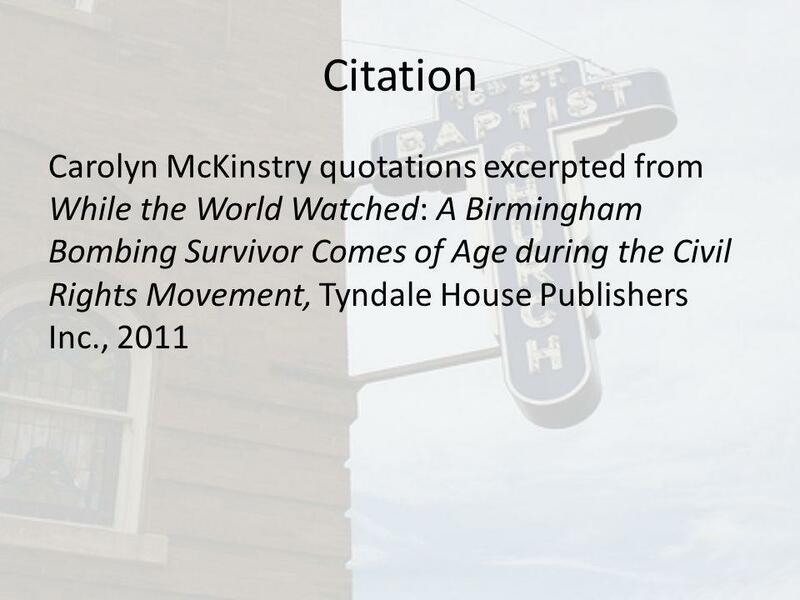 34 Carolyn McKinstry Presentation *Clicking on the book hyperlinks to Carolyn McKinstry on-line presentation. 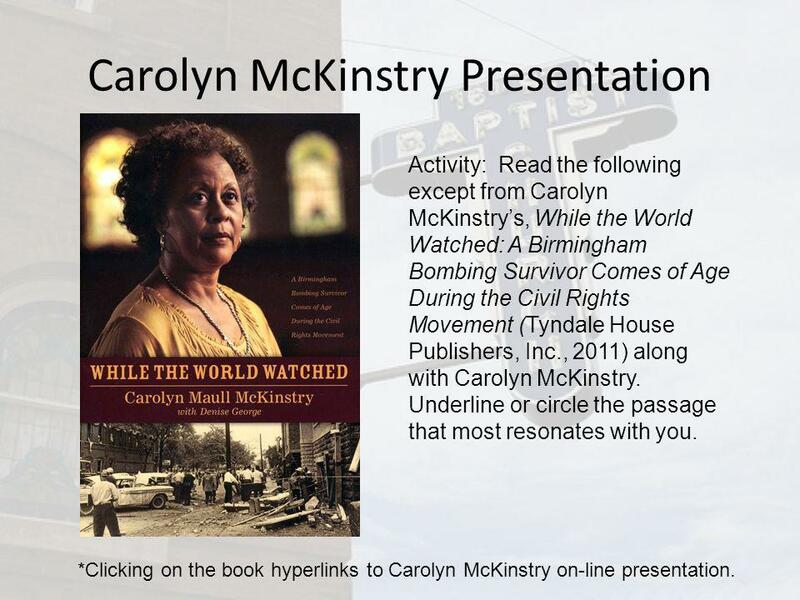 Activity: Read the following except from Carolyn McKinstrys, While the World Watched: A Birmingham Bombing Survivor Comes of Age During the Civil Rights Movement (Tyndale House Publishers, Inc., 2011) along with Carolyn McKinstry. Underline or circle the passage that most resonates with you. 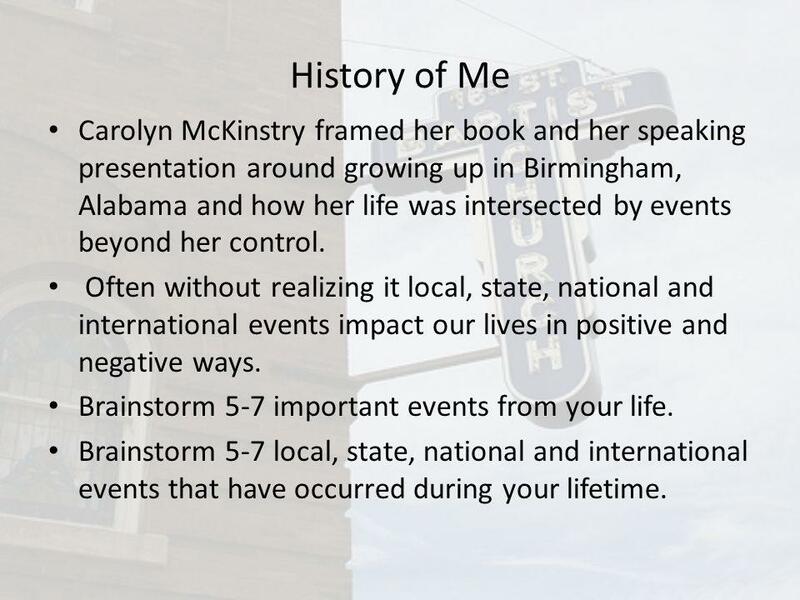 35 History of Me Carolyn McKinstry framed her book and her speaking presentation around growing up in Birmingham, Alabama and how her life was intersected by events beyond her control. Often without realizing it local, state, national and international events impact our lives in positive and negative ways. 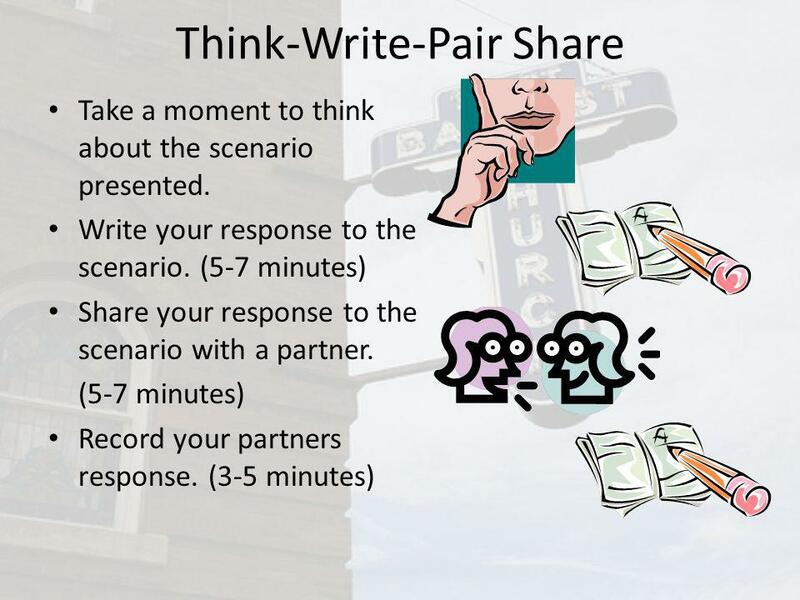 Brainstorm 5-7 important events from your life. 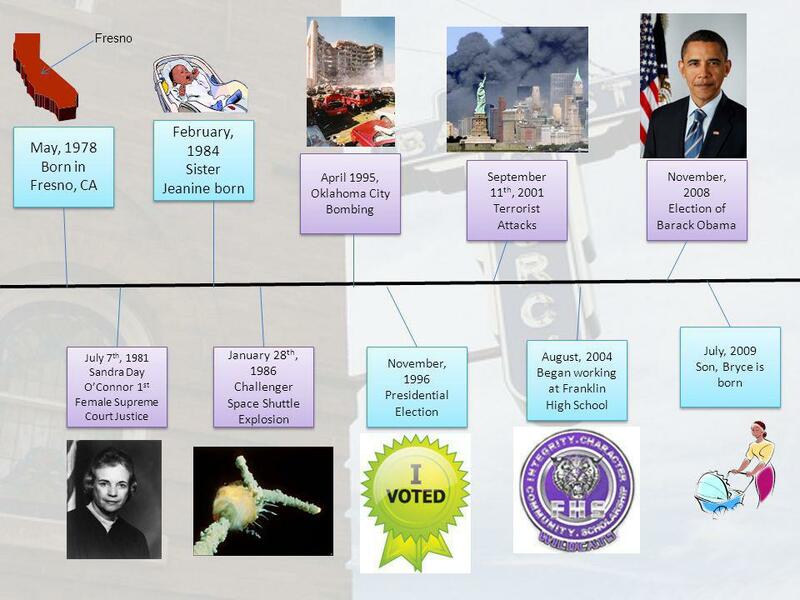 Brainstorm 5-7 local, state, national and international events that have occurred during your lifetime. 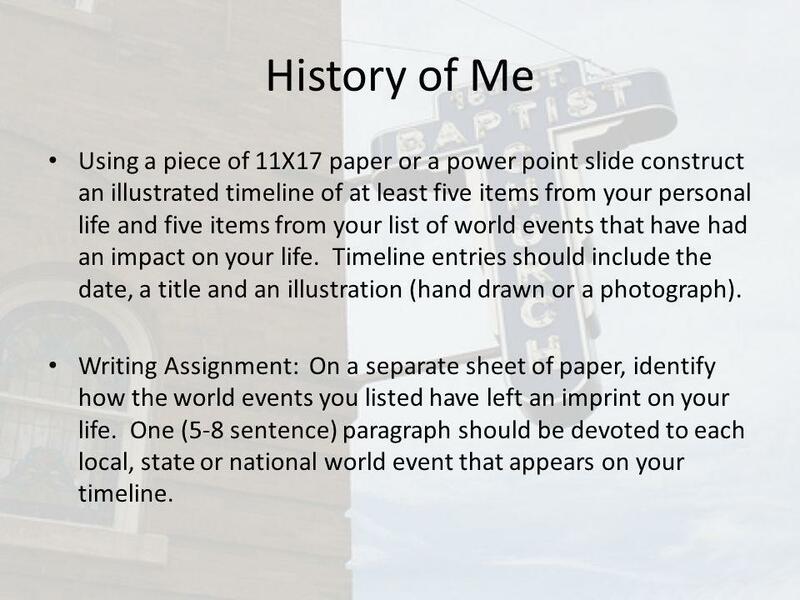 36 History of Me Using a piece of 11X17 paper or a power point slide construct an illustrated timeline of at least five items from your personal life and five items from your list of world events that have had an impact on your life. Timeline entries should include the date, a title and an illustration (hand drawn or a photograph). Writing Assignment: On a separate sheet of paper, identify how the world events you listed have left an imprint on your life. One (5-8 sentence) paragraph should be devoted to each local, state or national world event that appears on your timeline. Download ppt "Activator Week 14 Day 1 Write an engaging newspaper headline for at least one of these pictures." The Emergence of Civil Rights as a National Issue When thousands of blacks marched through downtown Birmingham, AL, to protest racial segregation in April. Rosa Park By Nafisa Rahman. Instructions Go up to the top left hand side of the screen and click on FILE. Go down to SAVE AS and click. Next to the box that says ‘My Documents’, click. Successes and Setbacks By: Stephanie, Lauren, Nikole, Yasaman, Doug, Ben. Broadwater School History Department 1 Revise for GCSE Humanities: Black Americans This is the third of nine revision topics. America and the Cold War. Birmingham, Alabama Aim : Examine the effectiveness of the 1963 demonstration in Birmingham, Alabama. ALABAMA REMEMBERS THE CIVIL RIGHTS MOVEMENT By Ann-Marie Peirano. Daring to Dream: Dr. Martin Luther King, Jr. A presentation for grades 6 through 8 by the Rice University Black Student Association and Office of Public. Civil Rights. Rosa Parks Refused to give up her seat on the bus for a white person and was arrested, her actions led to several bus boycotts. Martin Luther King, Jr. January 15, 1929 – April 4, 1968. Daring to Dream: Dr. Martin Luther King, Jr. A presentation for grades K through 2 by the Rice University Black Student Association and Office of Public.